When asbestos or asbestos containing materials (ACM) are disturbed either intentionally (removal), or accidentally (by inadvertent contact during routine maintenance), or by environmental elements (water damage, vibrations, air movement, etc. ), the fibers can break loose, become airborne, and then be inhaled or ingested. How Long Does Asbestos Remain Airborne? 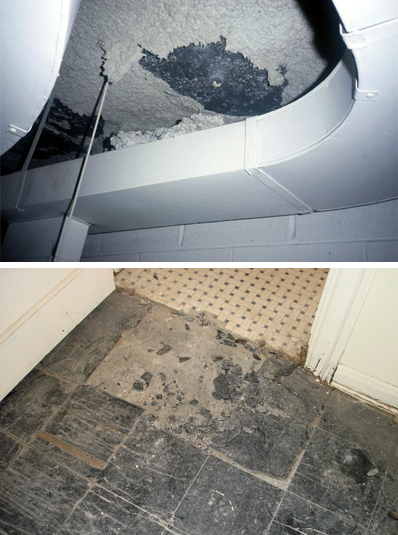 Asbestos fibers, once released, are capable of remaining airborne for a long period of time. Fibers become suspended in the air by disturbance of the friable ACM, deterioration causing the material to release fibers, and by resuspension of previously released fibers that have settled onto floors and other surfaces. Resuspension of asbestos fibers that have settled may result from many different activities including dusting, sweeping, vacuuming, and even ordinary movement in the vicinity of the settled fibers. This process of release and resuspension of asbestos fibers may result in the continued dispersal of asbestos fibers throughout the building.